The shaking and vibrating of the earth surface is called an earthquake. The shaking may vary between very small tremors to a violent vibration. Tectonic activities: The crack or bend in the rock where movement takes place is called fault and the movement of the rock is called faulting. 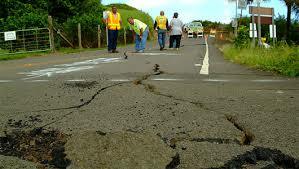 Earthquakes occur when rocks are subjected to stresses that they are not strong enough to withstand. It then spreads out in waves from the point of breakdown and produces the earthquake waves. Volcanic activities: In volcanic eruption not only magma but some smaller and bigger rocks are also forced out. Faulting, as well as the flow of such substances in the vent of the volcano, causes the vibration of the earth’s surfaces. Local activities: Many activities like an explosion of bombs, collapsing of mines, constructions of roads and dams etc. also support to cause an earthquake. The point inside the earth where the earthquake originates is hypocenter. The point on the earth surface that is vertically above the hypocenter is called epicenter. Earthquake is measured in Richter scale. Teachers, students including management committee should make a plan to be secure from the earthquake. Those places which are safe in accordance to the earthquake should be identified. The emergency materials and attendance register should be kept in the reachable place. All the teachers and students should stay under desk and bench and catch its legs. Where there are no desks and benches, all should go and sit in safe place and cover their heads with their hands, bags or books. If anything is not available for covering the head then, he/she should take a duck-cover hold position. Running, shouting, etc. should not be done. All should get out one by one in line without shouting and go towards the safe place. See if all of your friends came or not. If not, you should inform your teacher immediately. One should not go here and there as well as their home without the permission of the teacher. The shaking and vibrating of the earth surface is called earthquake. The point inside the earth where the earthquake originates is hypo center. The point on the earth surface that is vertically above the hypocenter is called epicenter. Earthquake is measured in Richter scale. The crack or bent in the rock where movement takes place is called fault and the movement of the rock is called faulting. 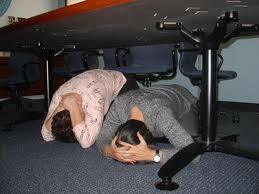 During the earthquake tutorial. Are you prepared ? What is an earthquake? Write any three causes of the earthquake. Earthquake is defined as shaking or vibrating of earth surface. 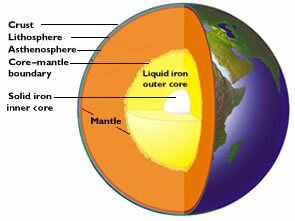 Tectonic activities: The surface of the earth is affected by the tectonic forces. Tectonic forces include compression and tension in the plates. Due to these forces, faults occur in the earth crust, which make a certain portion of the plate rise up and some other portion to fall down. Such phenomenon produce vibration on the earth surface and earthquake occur. Volcanic eruption: During the volcanic eruption, lava comes out with a force resulting disturbances of the adjoining area of the earth crust causing an earthquake. Generally, the volcanic eruption is followed by an earthquake. Other causes: Other causes of earthquake are: Expansion and contraction of rocks, structures of the land surface, flood, landslide and soil erosion, artificial explosion during the construction of tunnels, roads, mine etc. it disturbs the earth surface and cause an earthquake. What is meant by focus or hypocenter of an earthquake? The point inside the earth from where the earthquake begins is called the focus or hypocenter of the earthquake. What is meant by epicenter and seismology? The point on the surface of the earth vertically above the hypocenter is called an epicenter of the earthquake. The science that deals with the study of an earthquake is called seismology. What is meant by Richter scale? The scale that measures the magnitude of an earthquake is called Richter scale. What are the types of an earthquake and what are they? In a vertical earthquake, the vibration is up and down and in the horizontal earthquake, the vibration is lateral. Horizontal earthquake is more devasting than a vertical earthquake. Write the effects of the earthquake on the environment? It may form cracks on the earth's surface and weaken the rocks for the landslide. It destroys life and property. It destroys development structures like roads, canals, communication networks, electrical supply and water supply. It collapses monuments, buildings, temple, towers and industries. Water resources get contaminated during the earthquake which leads many types of diseases. Write the ways to be safe from an earthquake. Earthquake resistant buildings should be built. Education concerning the safety measures of the earthquake should be introduced in the school curriculum. The public should be made aware of a way of self-protection from the earthquake. Skillful volunteer manpower should be developed and kept alert for emergency rescue. Write the precautions to be adopted during an earthquake. As far as possible crouch under the table and protect the head from injury. Stand on the frame of the door until the shaking stops and stands from the sides of the window and outer wall of thehouse. Help to evaluate disabled people like children, old aged people. Stay far from big rocks, glasses and weak walls. Turn off gases, electric current and water supply as soon as possible. Stay in a safety place with patience and follow the instruction broadcast from the radio by the government. 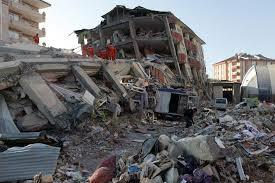 Name any two major earthquake prone zone of the world. Hypocenter is the inner place of the earth where the earthquake originates at first. The epicenter is the place on the surface of the earth where the first vibration of the earthquake arrives from the hypocenter. Earthquake is the shaking movement of the earth surface. It occurs at the joining parts of the continental plates when they move floating in the very hot liquid or semi-liquid materials. The volcano is the spewing of the earth. It occurs where there is a crack on the surface of the earth or the weak place which cannot bear the pressure of hot liquid of the inner part of the earth. List out of the effects of an earthquake. The buildings and houses fall down due to the earthquake. Infrastructures like roads, bridge, industries, dams etc. are destroyed. Diseases and famine may spread. Earthquake causes landslide tsunami and storms. They cause a lot of damages. Education regarding safety measures should be provided. Awareness should be provided to the public regarding self-protection. The shaking and vibrating of the earth surface is called ______. Which one of them is a computerized instrument used for measuring earthquake? Earthquakes having magnitude more than ______ Richter scale are more devastating. Magnitude of earthquake is measured in the unit termed ______. The point inside the earth where the earthquake originates is ______. The point on the earth s surface that is vertically above the hypocenter is called ______. Which one of the following is the effect of the earthquake? why nepal is prone to earthquake? Any Questions on 'Earthquake '?